Get your sewing machine out and tackle some of these free clothing patterns. You could have a whole new wardrobe in a few weeks. This is an extremely simple sewing pattern for making a pretty blouse out of a t-shirt. 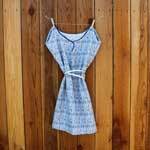 Have fun making this cute little mini dress with rib trim waistband by recycling an old t-shirt. Using knit fabric and this easy-to-follow shirt pattern you can have a cool shirt for your teen in less than an hours time. Pick your favorite colors and prints to make this easy to sew sundress with a tubular style top and flared bottom. 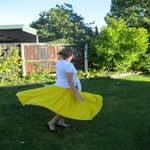 Sew a beautiful scalloped skirt. This skirt is unique and looks great when stepping out on the town. Need a skirt fast? This round skirt only takes about 30 minute to complete and looks great. This is a lovely dress that ties at the back into a big bow. The bottom of the dress is full for added comfort and the top is fitted with a V-neck in front and back. 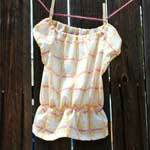 Create this adorable little top that is just perfect for those warm summer days. 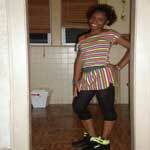 Top has elastic at the shoulders and at the waist. Using light and flowing fabrics you can make this romantic skirt with twirls on the sides. This skirt is simply feminine. 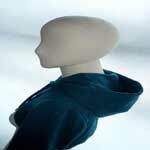 Make any shirt into a hoodie by following these detailed instructions for creating the top half of a hoodie. Say good night in pajamas you made yourself. 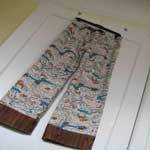 Make pajama pants that fit exactly how you want by following this simple pajama pattern. This is a pretty dress that is low cut and sleeveless. Enjoy wearing this lovely dress you made using this dress pattern. 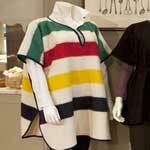 Unlike most ponchos, this poncho has short sleeves. This easy to sew poncho looks great when paired with a shirt and slacks. Cuffed shorts are always in style. This short project has easy-to-follow instructions to help you make great looking summer shorts. Skirt pattern for a tiered bohemian style skirt that is long in length and gives a free and comfy feel to your day. Here is a great project for the beginner seamstress. This pattern has a front and a back plus a small elastic waistband. Create a skirt that just screams summertime. Pair your skirt up with a cute top and flat sandals and you have a awesome summer outfit. 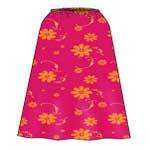 Here is truly a cute skirt that can be made short or long. The skirt has a youthful look and the ruffle adds a little flirtation to it. 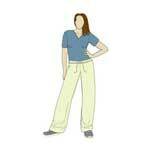 Comfy drawstring pants are great for exercising in or just relaxing around the house in. This is a dress pattern for a straight dress with spaghetti straps that tie. Dressed up or down this dress is elegant and comfortable. You can make this simple dress in a short amount of time. Dress it up by adding a belt around the waist or dress down with just the dress only.